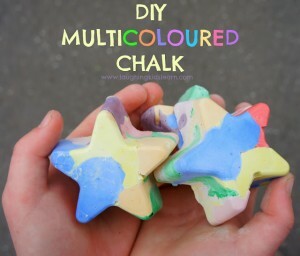 Children love chalk and so here is a unique way they can draw with it. 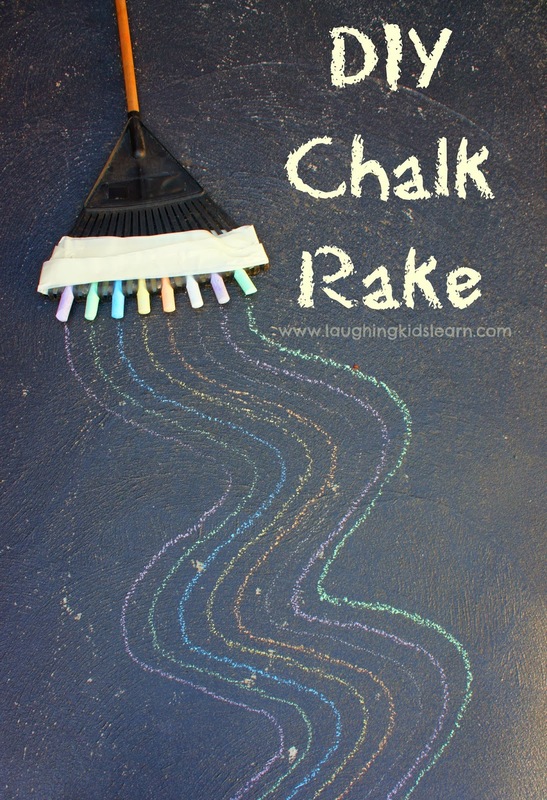 Why not make a DIY chalk rake that they can use to draw and write with. It’s also a great way for children to build their upper body strength and get creative. 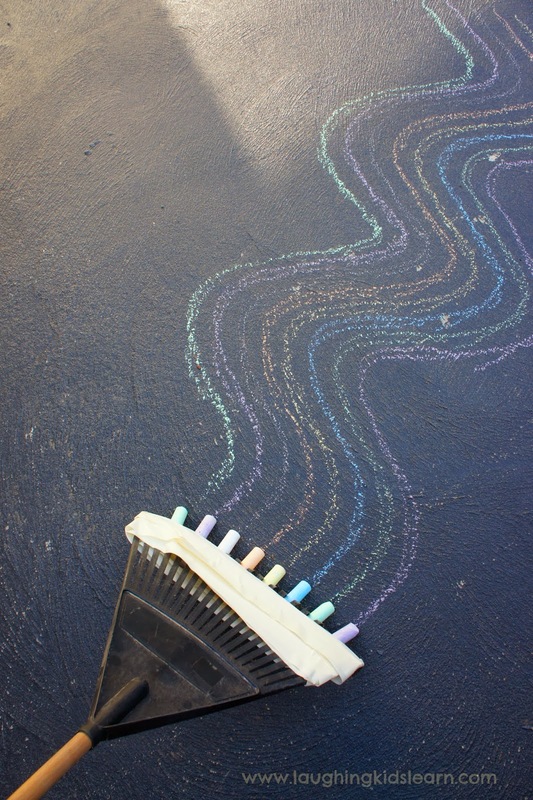 Drawing with chalk would have to be one of the top activities from my own childhood. 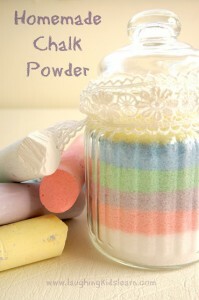 I think when you have those huge chunks of chalk in your hand it’s hard not to want to draw or write on a large scale. 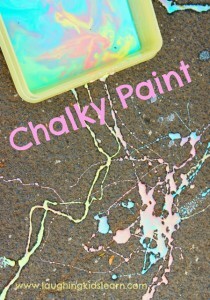 Here is another way you can use chalk that is ridiculously easy to set up and makes for some serious fun. Possum (23 months) was very interested to watch her daddy press a length of coloured chalk between the teeth of the garden rake. It’s important that the sticks of chalk were roughly the same length. Next, using the masking tape. Hubby was able to secure the sticks of chalk in place with a few rounds of tape. 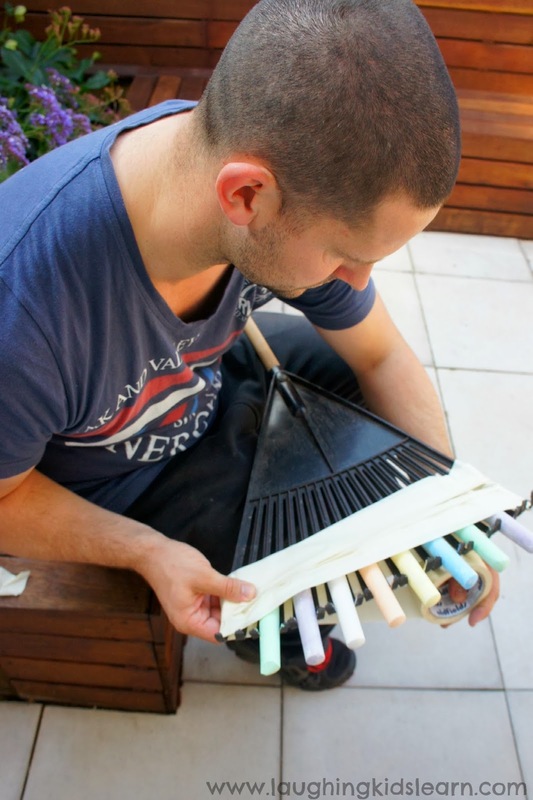 The teeth of the rake and the masking tape made the chalk quite secure! Possum had a great time moving the rake back and forth. What a wonderful lesson in cause and effect as well as developing upper body strength. Opps! 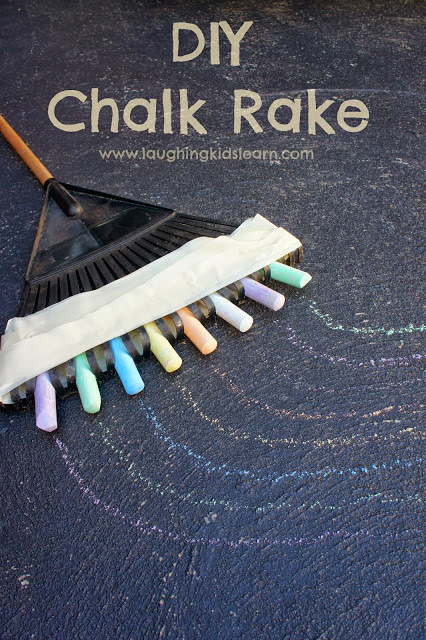 Unfortunately we did discover that some of the chalk would snap if the rake was raised and dropped on the ground. 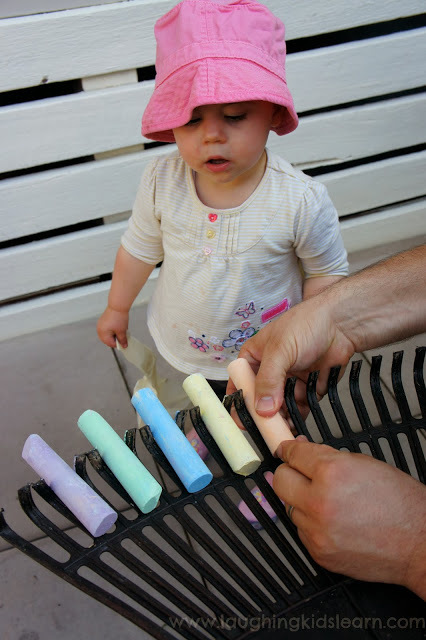 Here is a picture of Possum attempting to replace the chalk pieces (bless her). 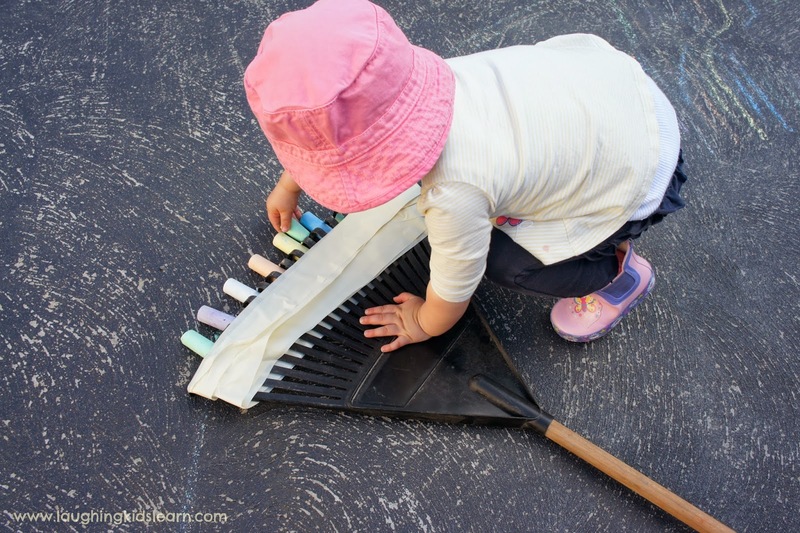 Would your child like to play with a chalk rake? 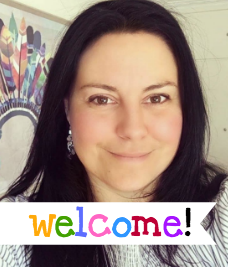 This reminds me of when kids just grab a handful of crayons or markers and draw with all of them in their hands, this is a great large scale version! oooh that is so cool and so clever!!! When I saw this, I thought ‘ Oh I wish I’d thought of that’. This really is such a cool idea. 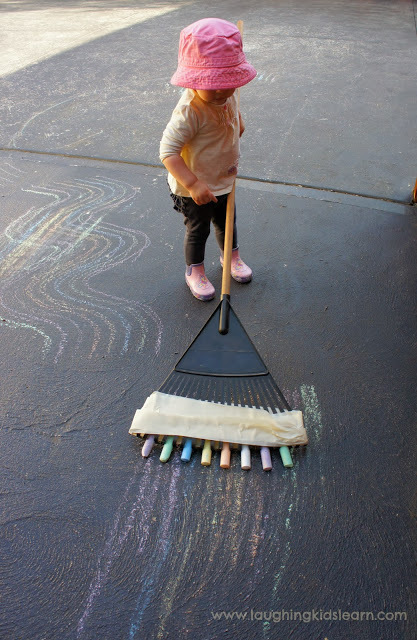 My kids love rainbows to, so I could just imagine rainbows being made all over the deck! Oh Kate I LOVE this. So simple yet so clever. We are definitely doing this. I have never seen anything like this! LOVE this idea! 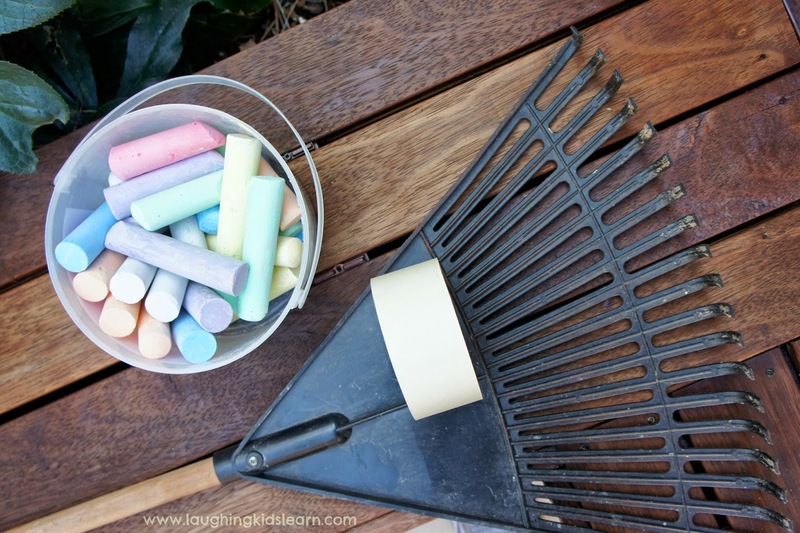 So very cool Kate 🙂 I can just see my littles running around giggling with their chalk rake behind them. Just popping back to let you know I’m featuring this on my Tuesday Tots post tomorrow. Thanks for linking up. I think my kids would have a lot of fun with that. Thanks for the idea! !